On July 2-4, 2012 the Global Voices fraternity together with their global partners, citizen media enthusiasts and audience will coalesce around the Pride Inn Hotel Nairobi Kenya for the bi-annual Global Voices Summit last held in Chile. Without doubt: this exciting, exhilarating and edifying event has been anticipated by many with much enthusiasm! This will be the first time the conference is held in East Africa and many of us in the region definitely wish to extend a warm welcome – Karibu (Swahili) to our visitors at the event. I must say I am extremely excited, all the more so since I am hardly a year old as a Global Voice'er, yet being part of the online community as a Kenyan author has proved beneficial in so many ways. I am eager to meet the very many faces of fellow authors and editors of whom I have had opportunity to work with online. Since the authors will be coming from different continents, cultures and backgrounds I am certain the learning curve for the participants will be nothing short of exponential. I am also certain that the discussions we will have, the moments that we will share, will be highlights, precious mementos to be cherished over and beyond a lifetime. To be among a pool of talent, intelligence, artistry that the Global Voices community encompasses is indeed a peak of privilege! That question has sort of puzzled me and to be honest, I was not part of the organizing committee, therefore I cannot second guess their reasons. In this post however I will highlight aspects that make Nairobi, Kenya a choice venue. Kenya as a country is well known for various reasons. We are best known for our bevy of athletes who dominate long distance races in various competitions all over the World. Kenya is also well known for its wildlife and tourist circuits being home to the Maasai Mara and other renowned world epic tourist sites (for more information on Kenya's tourism opportunities visit MagicalKenya Kenya's official Tourism Board website). The capital city Nairobi boasts of being one of the most unique cities in the world, with the Nairobi National Park hardly 15 minutes drive from the central business district. Perhaps the most well known fact about the country, is that the first President of the United States of African descent, President Barack Obama traces his ancestral roots to a place known as Kogelo, in the Siaya District in the western part of Kenya. 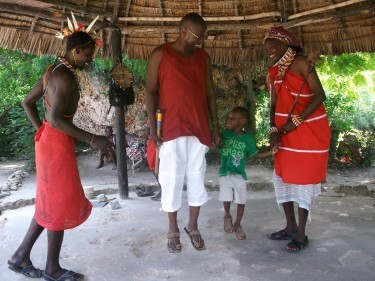 Locals from the region of the Luo tribe would add the expression, “But Do I say” in pride or recognition of that fact. I have chosen to highlight this with a specific purpose. Throughout his presidential campaign and in his book, Dreams of My Father, Obama mentioned that he had been inspired by the simple settings and manner of life of the people living in Kenya. His voice was so resounding, so inspiring, that many were moved to clamor for ‘Change that you can believe in”. Apparently, his campaign strategy which made massive use of social media propelled him to the White House. His voice, his story, illustrates that sometimes to solve complex issues simple solutions are needed. Kenya is home to the much famed mobile money transfer system here known as M-pesa (“Pesa” being the Swahili equivalent of money).The Mpesa payments and money transfer platform has offered new ways of seamless transactions both online and offline and is proving insightful in the global market as a payments solution. Kenya is also home to the Ushahidi platform, a crowd-sourcing open source crisis mapping solution that has been deployed worldwide in several crisis situations such as the earthquake in Haiti and the Tsunami in Japan. Kenya is also home to i-Hub and its sister organization M-Labs, an open space for incubating innovation and technology solutions. What can the participants at the summit hope to gain from the conference? The Kenyan setting is ideal, apart from the scenic appeal of the Rift Valley Highlands, the coastal cities, the Lake Victoria region, the Mau forests and escarpments. Kenyans as a people are also generally quite friendly and engaging. They are also very hospitable. Perhaps this is indicated in the fact that most Kenyans speak fluent Queens English apart from Swahili. In the tourist circuit do not be amazed to meet a taxi driver or tour guide speaking fluent Japanese, Chinese, German or even French… that is the diversity and perhaps a stark indication of the hospitality and social interest shown by the Kenyan people. Most importantly as highlighted here in the preceding paragraphs Kenya uniquely sets an interesting background and an enabling environment for innovation and inspiration. The Kenyan Government sets the pace in the region in creating an enabling environment, the right infrastructure and the development of innovative culture. Citizens of the country also enjoy a good measure of freedom of expression both online and offline. The beauty of the country and its people will for the most part contribute to a meaningful Summit with comprehensive solutions and decisions being arrived at that will help the Global Voices community continue to meet its mandate of highlighting previously unheard beautiful voices in this modern world, which today interacts more socially and more efficiently than ever witnessed before.